Despite confusion over what it should feature, Spokane continues to find peace in the one-acre reserve. Along with hosting the World’s Fair, the year of 1974 also marked the opening of the Spokane Nishinomiya Garden in Manito Park. The brainchild of Japanese-American Ed Tsutakawa, former Spokane Mayor Neal Fosseen and legendary parkland advocate Polly Mitchell Judd, it brought a slice of Japanese culture to Spokane just as the world came to visit. But now, nearly 40 years later, we see dramatic changes reflecting competing visions combined with bureaucratic expedience. William Youngs, in his definitive book The Fair and the Falls, traced the origins of the Japanese garden idea all the way back to the early 1960s — to Mayor Neal Fosseen and Ed Tsutakawa, who had just helped create the Sister City relationship with Nishinomiya, Japan. Tsutakawa was a Japanese-American who spent time in an internment camp during World War II and later became a noted artist and civic leader. When Expo came along, Tsutakawa saw his chance to bring their idea for a proper Japanese garden to life. He arranged for Nishinomiya officials to provide Spokane with the necessary technical help, including lining up a number of garden experts. Nagao Sakurai, who for 20 years had been the chief gardener at the Imperial Palace in Tokyo, agreed to design Spokane’s garden. Sakurai had helped design gardens in California, including the Zen Garden in the Japanese Tea Garden of Golden Gate Park in San Francisco, the oldest Japanese garden in the United States. We rely mostly on oral history to understand what Sakurai intended for Spokane; he died in July of 1973, before the garden opened. Two public document searches turned up very little. And the other principals — Fosseen, Tsutakawa, Judd — have passed away as well. An early Sakurai sketch is framed and under glass at City Hall. But, turns out, there’s a second, much rougher sketch that was only recently discovered by Steve Nittolo, horticulture supervisor for Spokane Parks. When Nittolo arrived on the job five years ago, he began to wade through files and cabinets, many not opened in years. It was then he stumbled upon this sketch, likely Sakurai’s original. Both sketches highlight the recent and rather dramatic changes to his garden. The story should begin with his original vision. The Japanese have been creating gardens with spiritual meanings since around the time of Jesus Christ. Over the centuries they evolved into highly idealized landscapes filled with symbolism and ritual. When Japan was opened to the rest of the world by Commodore Matthew Perry in 1854, the fascination started. By the 1890s, there were Japanese gardening books in English and the copycatting had begun. Today, there are traditional Japanese gardens all over the world. There are a variety of types of Japanese gardens, including a strolling garden, where the visitor experiences a series of carefully staged, idyllic scenes as they walk through. Another is the tea garden, which leads you through a series of contemplative moments culminating at the tea house, where the traditional Japanese tea ceremony would happen. Modern Japanese gardens can be a hybrid of multiple styles. Sakurai’s original design for Spokane shows a zig-zag bridge crossing north to south across the island. It also shows stepping-stones along a trail that makes its way over the stream just below the falls. Sakurai apparently decided that the stepping-stones would be large enough, and the stream sufficiently docile, to permit visitors to walk across the stones. In the sketch at City Hall, visitors are clearly intended to walk across the stream on the stones. Today, however, the zig-zag bridge is gone. The stepping-stones, closed off. In fact, visitors can’t cross the stream at all. They are abruptly stopped on either side of the stream, which creates a very awkward circulation pattern that interferes with the very tranquility and contemplation the garden is intended to produce. Sakurai’s original designs also plainly show an upper trail. Visitors could walk that trail to the top of the falls, where they would find more stepping-stones across the upper stream. From there they would walk down to the shelter on the south side and from there back to the pond. The walk emphasized the mystery of the garden and was supposed to end at a ceremonial tea house. Both sketches clearly show a tea house. The upper trail was open for years but has since been closed. And the tea house, the crucial destination within any Japanese tea garden, was never even built. After Sakurai’s death, after the opening of the Spokane Nishinomiya Garden and after the World’s Fair, Ed Tsutakawa took control of the garden. Bressler refers to the pruning, the plantings, the overall look, the protocols — everything. Tsutakawa was involved down to the smallest detail. Bressler recalls a long argument they had over the look of the restroom structure, which isn’t even inside the garden. “That argument went on and on,” Bressler recalls. A decade later, when the Americans with Disabilities Act required that an arch be lowered for wheelchair access, “Ed threw a fit,” says Bressler. From the outset, a river of controversy has flowed underneath the garden’s tranquility. The issues hit the organizational rapids beginning in 1988, when, Bressler says, the Parks Department decided it needed some professional advice on its Japanese garden. Spokane hired Masa Mizuno, who has worked on the famed Portland Japanese Garden among many others projects. A while later, the city received his report. Turns out Mizuno didn’t like much of what he saw. Simchuk states that for Mizuno the most important elements of any Japanese garden are the view corridors. He identified three: from the arch bridge looking east to the falls and above; from the arch bridge looking west; and from the west end of the pond looking back at the falls. 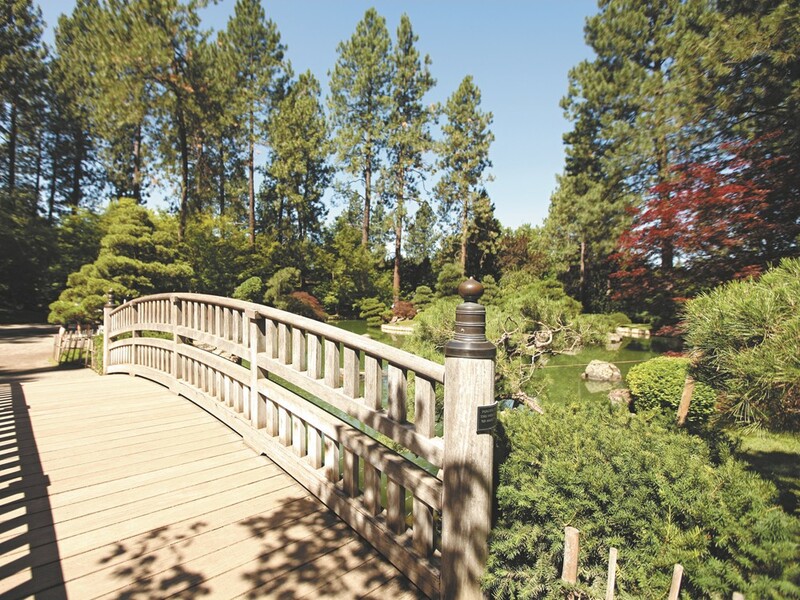 In Mizuno’s opinion, Spokane’s Japanese garden violated all the rules about view corridors. The zig-zag bridge (commonly known as “The Tsutakawa Bridge”) should come out because it compromised two of the primary view corridors. The stepping-stones across the stream should be cut off, he thought, so that people crossing the stream don’t clutter two view corridors. The upper trail should be shut off because, again, people can wreck the scene by making their way up and around the upper falls, which would also clutter two primary view corridors. I tried to locate the Mizuno report in the city’s archives. All city staff with whom I spoke recalled that it was a written report. But my interviews and two official document searches failed to produce the report. Nittolo placed a call to Mizuno, who said he would look. Mizuno got back to Nittolo with word that, actually, the report was never written; rather, he had made an oral report. Still, notes should have been taken; I have not been able to locate any. Remarkably, ever since 1988, what city parks personnel thought they had read in a written report has driven all decision-making for the Spokane Nishinomiya Garden. As it turns out, Mizuno’s recommendations — for entirely different reasons — actually supported what the city wanted to do anyway. The zig-zag bridge had rotted (as had the arch bridge) and needed to be replaced. The city didn’t want to spend the money and Mizuno’s critique let them off the hook. No more zig-zag bridge. The stepping-stones, some thought, invited an accident. So, coincidentally, getting rid of the stones across the stream also played right into the city’s risk-management agenda. And the upper trail? Bressler says the city long had experienced difficulty maintaining the upper trail, especially in the wake of visits from elementary school children. Bressler says the kids routinely trampled shrubs and broke tree branches. So shutting down the upper trail was also OK with the city. When I talked to Mizuno, who lives in Portland, I asked him how a famed designer such as Sakurai could have made all these mistakes. He insisted that these all were design errors that compromised what should be the highest priority: view corridors. But a Japanese garden is more than view corridors. In The Room in Context, Katherine Benzel points out that Japanese gardens are all about an “experience.” Mystery is everywhere. Along the way, we walk over “stepping-stones spaced far enough apart to require us to look down and concentrate on where we are stepping.” We must focus. We cannot turn around. She discusses “sequence … transition, contrast, emotion, self-awareness and time prepares us for the tea ceremony.” Zig-zag bridges, she writes, are important because, according to legend, evil spirits can only travel in a straight line. I pointed out to Mizuno that his insistence on view corridors resulted in the garden losing some of its ritualistic and symbolic authenticity. Apparently Sakurai thought accepting some visual clutter in the interest of protecting ritual and symbol was a good trade, whereas Mizuno thinks otherwise. He didn’t disagree with my assessment. It’s worth pointing out that the Portland Japanese Garden occupies five-and-a-half acres; ours sits on a little over one acre. Given our space limitations, some trade-offs may have been unavoidable. Mizuno agrees, but insists that the integrity of the view corridors should come first. The question then becomes, if view corridors are what we want to protect, are the plantings and prunings accomplishing that objective? Today trees and shrubs almost hide the falls from view, both from the bridge and the west end. And the view corridor from the west end is obscured by the island. It seems neither vision — Sakurai’s nor Mizuno’s — is being realized. “From the beginning, the garden has been driven by personalities,” says Bressler. Never were truer words spoken, to which I would only add the word “passion” — personalities with passion. Masa Mizuno says that Japanese gardens “evolve” — that they are living things. As I reflect on Nittolo’s remark, I’m inclined to think that maybe a proper evolution needs exactly this — more personalities with passion. Perhaps controversy, part of the Japanese garden’s story from the beginning, is the cost of protecting this grand legacy from slowly and quietly being transformed into just another park space managed by well-meaning civil servants who possess neither the vision nor the expertise — nor even the resources — to ensure the kind of evolution the garden deserves. We might begin with Steve Nittolo “taking on” the circulation and stepping-stone issues with Mizuno. And when possible, decisions should honor the vision and contributions of Polly Judd, Ed Tsutakawa and Nagao Sakurai.